Herbet, IV, 1900, 303-304 (1969, 153-154), VI (Petits Cartouches), 4. COLLECTIONS: Amsterdam (De Jong and de Groot, 1988, 226, 542.4). Florence, 12787 st. in vol. (10.7 x 17.4 S). New York, 62.525, no. 27. Zerner, in RdA, 1972, 117, Fig. 178. Béguin and Pressouyre, 1972, 126. With some variations, this etching appears almost certainly to be based on Fantuzzi’s print (Fig.E.64) related to the frame of the Combat of Centaurs and Lapiths in the Gallery of Francis I. But in Du Cerceau’s print both nudes at the top play the same instruments, the garlands at the sides are different, and the discs held by the herm-priests do not show the Royal F. The salamander is in reverse. 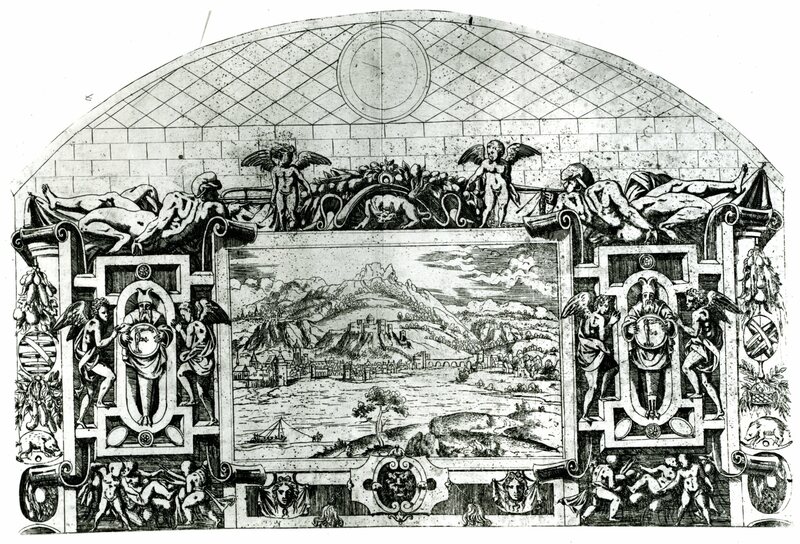 Basically, Du Cerceau’s print reproduces the left half of Fantuzzi’s etching and then reverses it at the right.